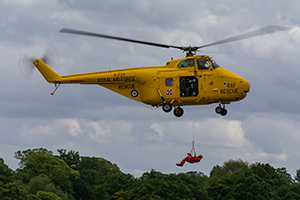 The RAF Cosford Airshow is presently the only air show organised by the RAF and therefore it was no surprise to see a wide range of RAF showcase pieces within both the flying and static line-up. 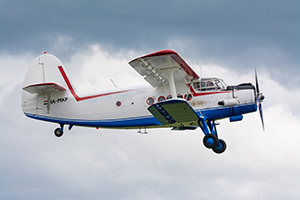 RAF Cosford is still an operational base playing home to the No.1 School of Technical Training, the Aerosystems Engineering & Management Training School and the No. 1 Radio School. The famous RAF museum is also adjacent to the airfield and was open throughout the event. Around the showground a wide array of ground displays provided varied entertainment for both families and enthusiasts. In terms of aircraft the museum already holds over 75 airframes which were all on display, with some being moved to more photogenic positions outside of their usual hangar space. 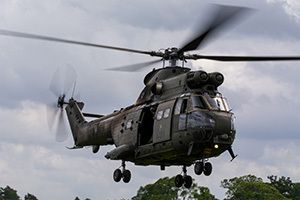 RAF Cosford were also able to provide a number of Tornadoes and Jaguars to sit alongside varied visitors such as the A400M Atlas and Puma helicopter which fitted into the main air show theme of ‘Battlefield Support’. Despite the threat of low clouds and fairly strong winds the flying display was able to go ahead with only minor tweaks to the schedule. First up was the RAF’s parachute display team; the RAF Falcons who dropped in from their new Dornier Do228 aircraft in full-Falcon livery. 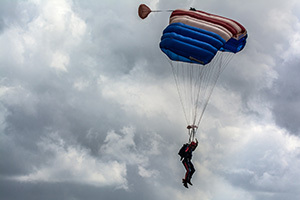 Despite the windy conditions the 9 parachutists were able to form their trademark 'non-contact' canopy stack. Before the last parachutist had touch the ground the Grob G109 was already well into its spirited display, like the Falcons the coloured smoke really added to the spectacle. 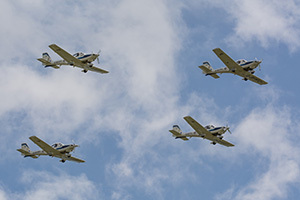 It was then the turn of the Cosford based University of Birmingham Air Squadron to provide a fly-past in a formation of 4 Grob Tutors. The displays flowed at a good pace, leaving little space to breathe, before the last Tutor had touched down the Battle of Britain Memorial Flight were already on the horizon. 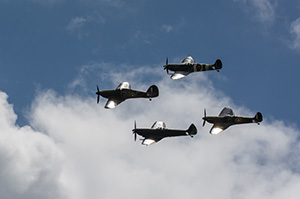 This year celebrating 60 years since their formation, the BBMF are out to impress. Sadly the Avro Lancaster is not yet out of its major service but the crowd were happy to settle for the awe-inspiring ‘Thompson Flight’ in memory of the flight’s founder, Group Captain Peter Thompson DFC. Today the flight consisted of 4 fighters, 1 Hawker Hurricane and 3 Supermarine Spitfires who performed a dynamic aerobatic routine consisting of loops, breaks and four-ship formations. 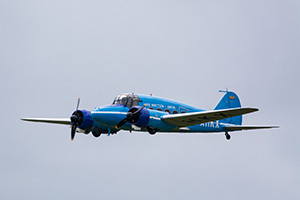 The next set of displays included an ASK21glider from RAF Cosford Wrekin Gliding Club and BAE Systems Avro 19 Anson flying in from Old Warden in its effervescent blue civilian markings. 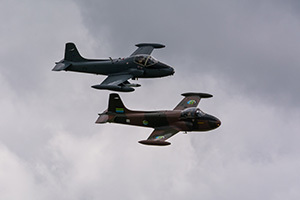 We were also treated to a search and rescue demonstration by the rarely seen Westland Whirlwind and a thrilling pyrotechnic routine from the BAC Strikemaster and Jet Provost pairing. The later, sadly making up the only classic jets of the flying display. The early afternoon saw a run of aerobatic team displays; firstly the Blades team saw 3 ex-Red Arrow pilots put their Extra EA-300’s through their paces. 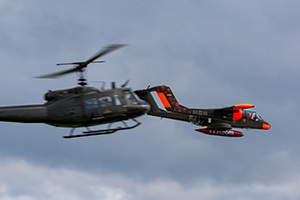 The team were one aircraft down, but their display was a seamless routine of high-energy manoeuvres and daring passes. 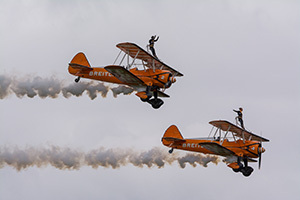 The more sedate but no less-daring Breitling Wingwalkers were next as they displayed their Boeing Stearman aircraft complete with flexible models performing acrobatics on top of the aircraft, seemingly unfazed by the breezy conditions. 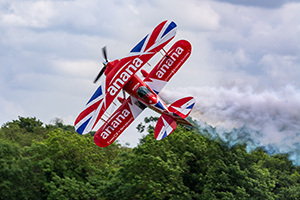 Rich Goodwin completed a trio of aerobatic acts with a completely insane performance in his Pitts Special ‘Muscle Biplane’ that defies both belief and gravity. 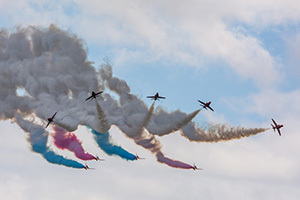 The Royal Air force Aerobatics team, commonly known as the Red Arrows and their 9 Hawk jets are a highlight of any show. Today, they were limited to their intermediate ‘rolling’ display due to low cloud base. As ever the performance was impeccable, however, a change in display axis to meet new regulations made the display seem a little distant at times. 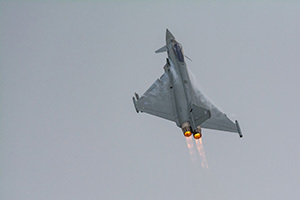 The Eurofighter Typhoon was the only other display item restricted to these limitations, but sadly due to an unserviceable aircraft the Typhoon was only able to flypast, albeit at a dramatic high speed with full afterburners, before disappearing into the clouds. 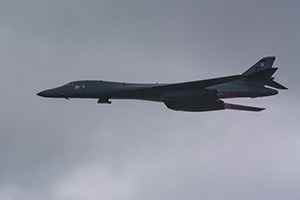 Undoubtedly, the most prestigious flypasts of the afternoon were the rare appearances of the large American bombers; firstly we were treated to a rare public appearance from the B1 Lancer ‘The Bone’ which unfortunately timed its flying with a brief period of rain and low cloud. 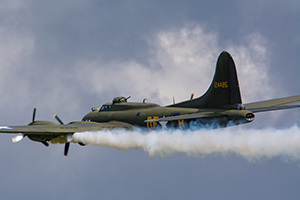 Next up was the Boeing B17 Flying fortress ‘Sally B’ providing some elegant sweeps and an emotional tribute to the lost crews of the 2nd World War. The B17 display was interrupted by one of its successors; the Boeing B52 Stratofortress which performed two galvanising flypasts. 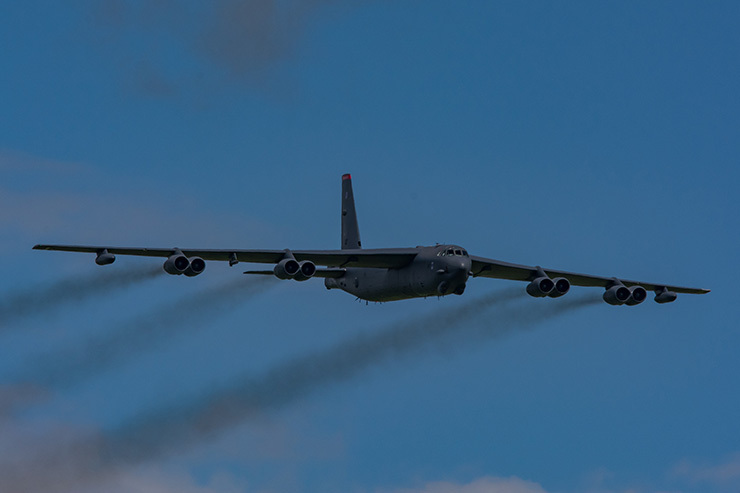 Seeing these two iconic American Bombers in the sky at the same time was truly a memorable experience. The American theme was continued with a fine display from Peter Teichman and his P51 Mustang, now displaying in its original red tail markings. 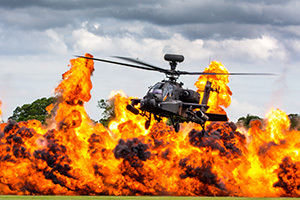 There was also an explosive display from the Army’s Apache Attack Helicopter, complete with astounding pyrotechnics. 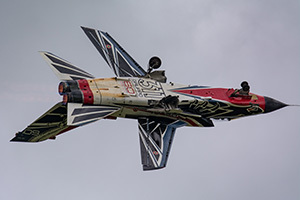 The Swiss PC-7 team and the elegantly-marked Italian Tornado added an international flavour with two superb displays. 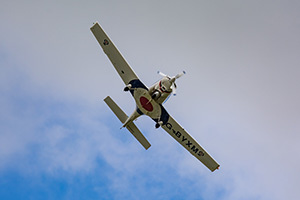 The home team also demonstrated some remarkable flying showing us the aerobatic capabilities of the Grob Tutor, whilst the airfield below was alive in a flurry of activity as a plethora of aircraft prepared for the finale. As previously mentioned this year’s main theme was ‘battlefield support’ the finale was designed to demonstrate this to maximum effect, we saw the Antanov AN-2 play the role of the enemy whilst the OV-10 Bronco accompanied by the ‘Huey’ and ‘Loach’ helicopters was deployed to eliminate the threat, providing another opportunity for the busy pyrotechnics team to do their thing. 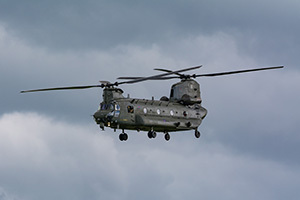 It was then left for the RAF to close their own show with a welcome return of the Boeing Chinook demonstration after a year’s absence, a fitting end to a remarkable and varied flying display, which demonstrated the best of British and International aviation. This was a well-organised show where praise should be given to the organisers for not only providing vast and varied entertainment but also, for superbly managing the 50,000 people in and out of the venue with limited delays.